...and if Matador is too occupied reissuing Chavez and Pavement records, I suppose there's nothing we can do about that. But someone is sure missing out. So, let it never be said that WFMU fails to bring the meat and potatoes to the table when digging for and presenting culture-defining artifacts. Released on Casablanca, recorded live 1979 at the Roxy in Hollywood with backing band that includes Christopher Guest credited as Nigel Tufnel (three years before Spinal Tap, though well dressed and with short hair), Ming the Merciless, Lars Svenki, Dwight Night and Beanie Barnhill. Tracks flow into each other as it's a live record, so MP3's of Side One combined: "Vamp On", "Night After Night", "Creature Without a Head", "King of the Cars", "Squiggy's Wedding Day", "Love Is a Terrible Thing." Side Two: "Babyland (For Eva Squigmann)", "(If Only I Had Listened To) Mamma", "So's Your Old Testament", "Sister In Law", "Honor Farm", "Starcrossed", "Only Women Cry", "Foreign Legion of Love", "Vamp Off." Thank you to Amanda Barrett for donating this and many other of Mr. Boyd's records to the station. As for Collectors' Choice, you clearly goofed bigtime by picking the Laverne and Shirley record instead. 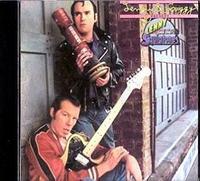 I love "Squiggy's Wedding Day" from this album. Not only is it a catchy tune, but it's a pretty good comedy bit, with Squiggy dissing his buddy Lenny in favor of having pop culture icons at his wedding. Also gotta love his take on harmony: "all it is is singing the melody wrong!" interesting link as who's the drummer on this record, at least who's pictured as the drummer! oh my god, i had this record when i was a kid! thank you for sharing this! I've been looking for this record for years. People never believe me about it's existence. Now if I can find some decent cover art. I saw Lenny and the Squigtones perform "Creature Without a Head" on FERNWOOD 2-NIGHT (the MARY HARTMAN MARY HARTMAN spinoff Harry Shearer worked on) and, IIRC, WONDERAMA with Bob McAllister. Here's hoping we eventually get a CD box set of Credibility Gap stuff -- they were contemporaries of the Firesign Theater/National Lampoon, and their comedy holds up 30+ years later. Trivia: Michael McKean roomed with David L. Lander while attending Carnegie Mellon in Pittsburgh. McKean transferred to NYU where he roomed with... Christopher Guest. Christopher Guest is on this record as "Nigel Tufnel"
I bought this album new at the now-forgotten Korvettes department store chain. Michael McKean was an alum of my high school on Long Island and played a set at the school's 25th or 30th anniversary fiesta. I brought the poster along to have him sign it but I was too embarrassed to ask. He did say hi to me as he walked by. His mother used to work in the school library even after he graduated and the poor woman had to overhear all sorts of sad juvenile pervert humor. Wow I can't believe I finally found some quality mp3s for this absolutely classic late-70's comedy album. I loved this when I was a kid and it is every bit as good now. This seriously does need a cleaned up CD release. I have a great quality scan of the front cover if anyone still reading this (old post, I know) wants or needs it. Stumbled upon it back in February. Great savings by shopping at Collectors' Choice Music store.....!